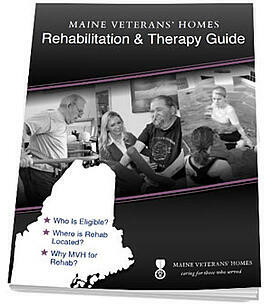 Get everything you need to know about rehabilitation and therapy services at Maine Veterans’ Homes. Who is eligible for Maine Veterans’ Homes? Where are our rehabilitation services located? Why should you choose Maine Veterans’ Homes for your rehabilitation and therapy? Your free guide is waiting! “The staff has been fantastic. My physical therapist keeps me working … and she’s a very nice person with a good personality."